“What can we do to make the living room more cozy?” This was the question asked by homeowner during the first meeting. The original living room was two stories tall, with large windows on top of each other. The original fireplace was out of proportion and scale with the all-white room. As the remodeling project evolved, a new walk-in closet was added into the existing attic space, and the original master closet was converted to a hallway. A private mezzanine-den was added for the couple above the living room. Problem solved! A new fireplace and stone surround were installed, flanked by custom bookshelf-display cabinets. 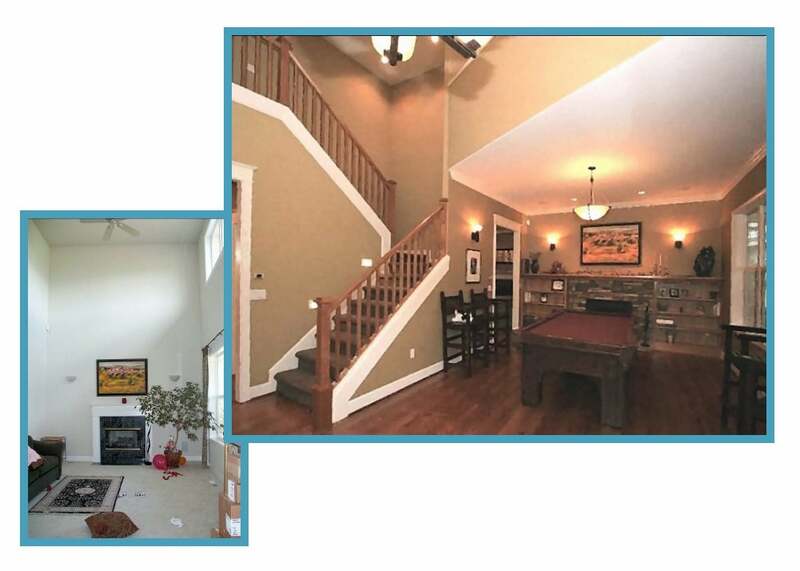 The carpet was replaced with hardwood flooring, and the colors were changed to a deep, warm palette. When completed, the couple decided that a typical living room didn’t fit their lifestyle. They converted the living room into a billiard room! This project won a national award for best use of interior space.